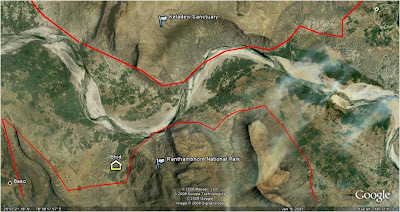 Ranthambhore Tale's.. .: An SOS – For the Protection of Corridor Between Ranthambhore National Park & Keladevi Sanctuary. 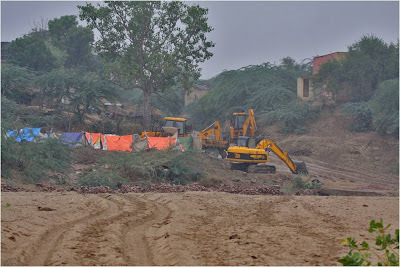 An SOS – For the Protection of Corridor Between Ranthambhore National Park & Keladevi Sanctuary. 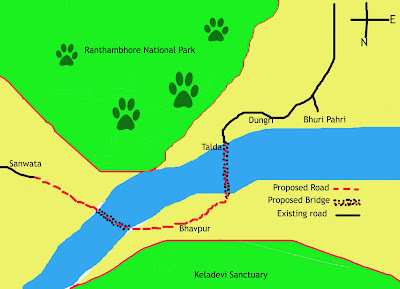 This document is meant to re-look at the conservation need for unhindered tiger movement between Ranthambhore National Park and Keladevi Sanctuary; the situation of corridor between the two areas and the human development happening in the region. Ranthambhore Tiger Reserve (RTR) is spread in a total of 1330 Sq. Km. area, which comprises of three protected areas; Viz. Ranthambhore National Park (RNP), Sawai Mansingh Sanctuary (SMS) and Keladevi Sanctuary (KDS). 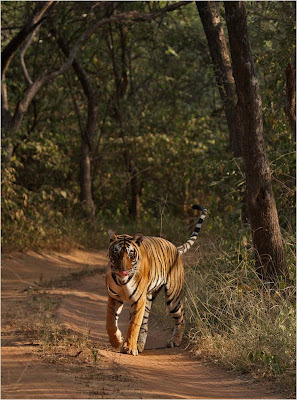 Tiger is found in RNP and SMS of the RTR. The reason being that SMS and RNP are well connected; however a state highway – Sheopur (MP) to Sawai Madhopur bifurcates the two. River Banas divides Keladevi Sanctuary and Ranthambhore National Park. Banas river dam is made in Bisalpur area to supply water in Jaipur; due to which the Banas River bed has dried up. Now this river bed is a gold mine for people as sand deposits are removed for construction. This sand supply is not sent to just Rajasthan area but is removed in such great amounts that it is supplied to U.P, Delhi, M.P. This humongous business has created a mafia lobby in the area. At this moment it is a simple dry river bed at places its width is 1 km while in others its about 2 km; a thin perennial water stream running through it. On one side is RNP and the other is KDS. Migratory birds arrive every season, silver sand is seen and at nights wild boars and chital heard are spotted here. Some villagers do a bit of agriculture in this area close to the river bed. But in the nights its a complete wildlife area left to the true inhabitants – the wild animals.In this area a huge pastureland of Bhavpur exists. 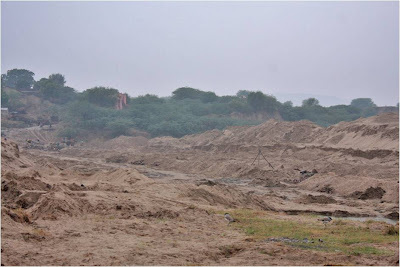 Road Network development – they are constructing a road between Sawata to Hadoti – there are some connecting roads between Bhavpur to Talada – to cross the river some bridges will be erected in this area. In the coming times this development will lead to heavy traffic in the region which will hinder the movement of many wild animals. The Forest department and conservationists alike are speaking of sending tigers to other sanctuaries while this important corridor area is left unguarded and neglected, it is a setdown for the entire tiger conservation lobby. Hope this matter is looked at with immediate attention. Just two years ago I remember hearing the Rajasthan Forest Department seniors talking about taking over this corridor, in a workshop in Mumbai. One must encourage tourism to the Park, It helps generate income for the local people. This will help in putting less stress on the Forest wealth and the Tiger. which otherwise is being denuded forcing the tiger and other animals to leave their Habitate and wander to unsafe places - villages, where they fall easy prey to Human beings.